“It would be almost impossible for the EU to survive if Marine Le Pen should win the up-coming French Presidential elections and withdraw France from it,” INSEAD Political Science Professor Douglas Webber told 17 AAPA members on March 21. “Europe can survive without the UK, but not without France. It would be a political earthquake,” he continued, referring to Le Pen’s vow to negotiate new EU membership terms if she wins the election and then put them to a referendum. 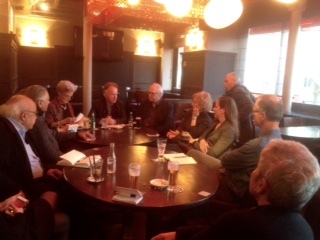 Prof. Webber spoke to us at an evening event at Café Falstaff on the Place de la Bastille. Ms. Le Pen would almost certainly have to try to take France out of the EU, as she would have no chance of implementing her program while France is in the EU: ‘Between 1/5 and 1/4 of the measures she’s proposing (leaving the single-currency Eurozone for example) is contrary to EU law,” he stated. On balance, however, Webber thought it unlikely that Le Pen would become president – or, if she did, that she would win a majority in favor of leaving the EU in a referendum. Webber discussed the evolution of the EU, the general political trend within Europe towards increasing nationalism, and the impact of the election of Donald Trump as 45th US President. The current state of affairs, opined Webber, has evolved out of three phases spanning the last 25 years: The Post-Cold War period, from the fall of the Berlin Wall and the subsequent collapse of Communism in 1989 to the Iraq civil war beginning around 2004 and the financial crisis of 2008; a transition period, from 2008 until 2015, including growing contestation of globalization and Europeanization and a growing number of terrorist groups and attacks, and finally an emerging post-liberal period, including terror attacks in France and elsewhere in Europe in 2015-2016, the Brexit referendum and the election of Donald Trump marked by growing nationalist, isolationist and protectionist sentiments. Contrary to popular opinion, Webber believes the Brexit vote and the election of Donald Trump have galvanized European voters to support the European Union rather than reject it, and foresees the election of the strongly pro-European Emmanuel Macron as French President, barring any “black swan” events between now and the second round of voting – such as an astonishing revelation or another terrorist attack. But he was less optimistic about the EU’s long-term prospects, as he was doubtful whether it could resolve the challenges posed by economic divergence within the Eurozone and a prospective rise in the number of people trying to migrate to Europe from Africa and the Middle East.